On Wednesday night, Kevin, Howie, Brian, AJ and Nick walked the red carpet in Nashville, TN at the CMT Artists of The Year before performing their own rendition of Florida Georgia Line’s “H.O.L.Y.” in front of a crowd full of country artists and other music industry elites. Less than 12 hours later, the Boys were in the air on a 24+ hour flight to Singapore to play a sold out show for more than 20,000 people in nearly 90° weather. If you’re asking if the Backstreet Boys still got it, the answer is clearly yes. Country Vibes On The Upcoming Album? 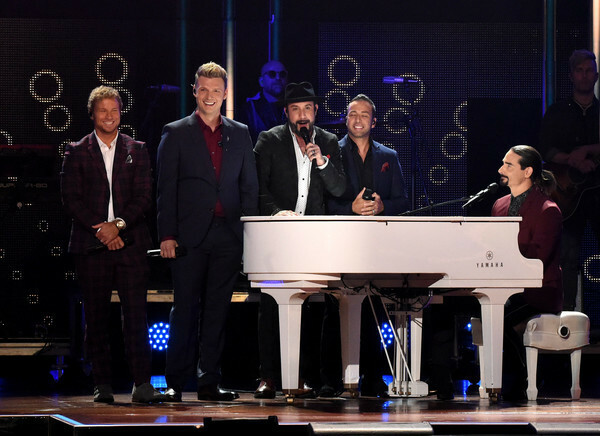 With the Boys’ transcending their pop “box” this year with their successful collaboration with Florida Georgia Line, the obvious question on everyone’s mind during the CMT Artists Of The Year red carpet interviews was whether or not Backstreet would continue down this road with their upcoming album. "We cut some Nashville songs recently, and just yesterday I was in the vocal booth," Kevin told Rolling Stone. "So we're in the lab playing around, experimenting." When asked if there might be another Florida Georgia Line collaboration on the BSB album, the Boys were enthusiastic about the prospect, telling Entertainment Tonight that they definitely might ask the duo to ‘return the favor’. In case you didn’t know, FGL was the entire reason the Boys were invited to the event. The duo is one of the CMT Artists of 2017 and who better to sing their song as a tribute but their Summer tour mates? If you missed their perfectly-harmonized cover of “H.O.L.Y” (or even if you didn’t), scroll down and watch (again). After receiving a standing ovation for their performance of country hit, the Backstreet Boys were on a plane to Singapore less than 8 hours later. Performing in their first show in Singapore since 2015’s In A World Like This tour, the Boys brought their whole crew and wardrobe from their Vegas show to perform a 90 minute show. The crowd, who sold the show out within hours of it being on sale, was thrilled to see Backstreet back in their country, singing along to every song despite the sweltering heat. “You like to see the Backstreet Boys sweat, don’t you?” Nick Carter asked mid-show, only to answered with tens of thousands of screams. You can also see the Singapore VIP Meet and Greet photos here. The Backstreet Boys will be back in the South on Friday for QTOPIA in Alpharetta, GA, with Nick staying the whole weekend for Walker Stalker Con in Atlanta. Tickets are currently still available for both events. See you there!